Tile Doctor is the largest specialist Tile and Stone maintenance network operating throughout the UK. We offer a free no obligation consultation service for home owners so if you need assistance do get in touch. Click the map to arrange a visit to your home or premises. Initial polish, only use with water. Victorian tiles are the ancestors of the modern Quarry tiles, the standard bearer for quality was a firm known as Minton Hollins an English manufacturer who unlike their competitors managed to make a very good product which has lasted the test of time; however all these types of tile were subject to Victorian building practice of the day and damp issues and salt problems (efflorescence) are quite common with these tiles. As such Tile Doctor has worked alongside tile cleaning agents to improve the products currently on the market. For deep cleaning and heavily soiled and neglected areas apply a solution of Tile Doctor Pro-Clean diluted 1:5 with water to the tiles directly. Leave to soak for ten minutes then agitate with a scrubbing brush or black pad fitted to a buffer machine. Extract soiled solution with a wet vacuum and then rinse thoroughly with water and vacuum again. To strip off waxes and acrylic sealers a stronger 1:2 dilution can be used. If glue from carpet grippers is present use Tile Doctor NanoTech HBU instead which is product designed to remove heavy dirt build-up and adhesives. If cement or grout haze (grout smears) is present use Tile Doctor Grout Clean-up which is a phosphoric acid that can break down the cement. Extract solution with a wet vacuum and then rinse thoroughly with water and vacuum again. To prevent possible salt issues (efflorescence) after cleaning use neat Tile Doctor Acid Gel and leave to soak into the tile for a maximum of ten minutes and then scrub with a deck brush adding water as you go. Extract solution with a wet vacuum and then rinse thoroughly with water and vacuum again. This will impede possible salt issues oxidising to the surface of the tile leaving white marks. Do not start sealing until all the white marks have disappeared and repeat the Acid Gel treatment in two to three days time should the salts re-appear. 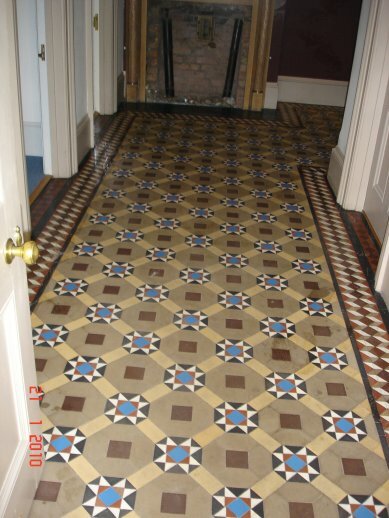 Original Victorian tiles were fitted without a DPM (damp proof membrane) as such it is widely recognised that the tiles should left to dry for several days following any deep cleaning to ensure the tiles are dry (especially during winter time and following periods of high rain fall), a damp meter is recommended to test for this. If a matt finish is preferred we recommend two or three coats of Tile Doctor Colour Grow, this has a colour enhancing agent that will improve the look of the tile. Additionally Colour Grow is a fully breathable solvent based impregnating sealer and provided the floor is dry before the sealer is applied the sealer will fully cure in 24 hours but can be walked on after a few hours of being sealed. If a deep satin finish is required then we recommend Tile Doctor Seal and Go which adds a nice sheen and lift the appearance of the tile, however this is an water based acrylic sealer and like Goldilocks porridge the conditions have to be perfect for this to work, i.e. no damp and no salts. Please note Seal and Go is not recommended for external applications. If a satin finish is required and the conditions of the installation are not perfect as described in option 2 we recommend Tile Doctor Seal and Go Extra which provides a lower sheen finish and can be used internally and externally as being a fully breathable sealer it is not affected by damp or salt issues. Please note as with all sealers the conditions need to be fully dry at the time of application to allow the sealer to fully cure, once cured (24 hours later) it will provide the required protection similar to Option 1. 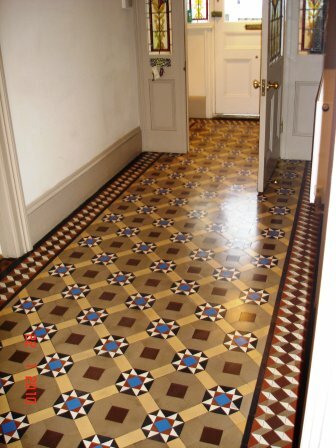 These modern type of tiles unlike their predesessor are a lot less porous and can be cleaned using the same techniques as original Victorian floor tiles however when it comes to sealing these tiles it is important to do a small test first because the sealer may be not be abosrbed by the tile due their low porosity. The sealer we recommend for these tiles is called Tile Doctor Colour Grow which is a matt finish sealer and will lift the colour of the clay; one or two coats should suffice. Always use a PH neutral cleaner such as Tile Doctor Concentrated Neutral Cleaner which once diluted with water becomes completely PH neutral unlike bleaches and washing up liquids which are not neutral and can damage the sealer with prolonged usage. Sealers will wear down over time depending on use so it is recommended to top up your floor sealer once a year with the original sealer; one coat should be sufficient and by doing this it will save a lot of time and expense in having to deep clean the tiles and re-seal every three to five years. When using our products please take time to familiarise yourself with the directions on the back of the bottle first. PH1 blend of Phosphoric and Hydrochloric acids in a gel form for the treatment of grout haze (grout smears) and efflorescence on wall and floor tiles. The gel is especially effective on vertical or sloped surface where where more dwell time is required. Colour Grow, is a solvent based colour intensifying sealer that provides durable surface protection as well as allowing the surface to breath and enhance colour. Grout Clean-Up contains concentrated phosphoric acid and cleaner designed to penetrate below the surface to remove light grout smears (grout haze), mineral deposits, rust stains and efflorescence. NanoTech HBU (formerly known as Ultra Clean) is a Heavy Build-Up Remover designed to work where other cleaners won’t. It utilises nano-sized particles to penetrate below tough stains, dissolve and lift them out. Most tile cleaning products sold on the market today are designed for cleaning ceramic rather than stone surfaces, as a result they can slowly etch away at the sealed surface of your stone floor reducing the life of your sealer. Tile Doctor Oxy-Gel is a Strong Alkaline Based Gel cleaner and degreaser which works well on Vertical surfaces where a long dwell time is required. A concentrated, multi-purpose high-alkaline cleaner, stripper and degreaser. Best for Heavily Soiled & Neglected Tile, Stone or Grout. A specially formulated water-based blend of acrylic polymers that provides both a stain resistant surface seal and a durable low-sheen finish. A special acrylic based formula which allows moisture vapour transmission making it partially breathable and ideal for situations where no damp proof membrane has been installed and where there is a low risk of Efflorescence occurring. If you have a problem with your Tile and Stone why not ask the Tile Doctor for advice. Contact us for a personal solution to your tile installation problem by calling us on 0345 512 0122 or e-mail Info@TileDoctor.co.uk. Please include as much detail about your issue as possible and if you feel it will help attach a photograph. Our Tile Doctor have many years of experience of dealing with the typical issues that people experience and were confident we can find the right solution. Alternately take a look at one of our dedicated sites below where we detail real examples of issues faced by our customers and how they were resolved.